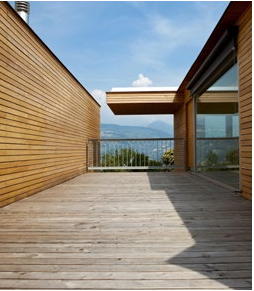 In Europe, and France in particular, the durability and preservation of wood are areas well covered by standardisation and regulations. The standards define the specifications to which the wood must comply, so that resistance to wood-destroying insects, fungi and marine organisms is ensured in service. End performances are defined by the fitness for purpose within a determined use class, that corresponds to the area of use of the wood. 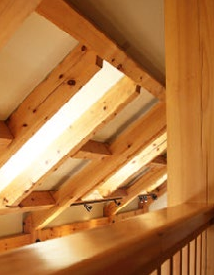 The role of the advisor is to assess the risks to which the wood structures are subjected. The standards to which advisors should refer are essentially EN 335 and NF B 50-105-3, as well as FDP 20-651. “Class 3 or class 4 treated wood” is a misuse of terms, this denomination is not proof of performance and fitness for purpose. 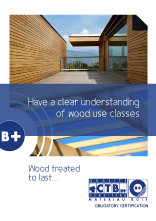 Wood “treated for fitness for purpose in use class 3 or use class 4” is correct. Examples of structures in this class: furniture, parquet flooring, panelling, woodwork and interior fittings, etc. The risks are limited to wooddestroying insects and termites. In these essentially non-structural uses, there are no regulatory requirements for the choice of wood species. Certain species that have been stripped of sapwood do not require treatment and are durable in terms of resistance to attack from insects (except termites). not totally excluded, but it is limited to the surface of pieces of wood at risk of occasional wetting (typically through condensation). – or made durable by means of the application of a treatment. NB: for obligations related to the risk of attack from termites, please refer to the Decree in force (2014-1427). The level of durability conferred can be chosen according to the severity of exposure, the amount of time the wood is exposed to wetting, the section of the wood pieces. In conditions of low exposure, where the wood is not very thick (class 3.1) and is only subject to wetting for short periods (as it dries quickly or because the structure has been designed to promote water drainage), superficial protection may be sufficient (achievable by all the procedures). To guarantee a longer service life, it is strongly recommendet to also apply surface coating products (timber preservative, paint) and to ensure they are maintained. In highly exposed conditions (class 3.2 ), where the wood is subject to frequent wetting over long periods, but not continuous, water can accumulate and the wood dries more slowly after wetting, deeper protection is required (achievable by autoclave). The wood is not in contact with the ground and is directly exposed to the weather, especially rain. Examples of structures in this class: windows and other exterior woodwork, external coatings, (cladding in general), parts of frames exposed to the weather (such as certain parts of roof structures), certain elements in poorly ventilated bathrooms, etc. In these uses, certain species stripped of sapwood do not requir treatment (except for protection against termites). This is the case, for example, with the duramen, or “heartwood”, of oak, chestnut, pine, larch, Douglas fir and other species of tropical origin. When treatment is required, it is only applied to species that are sufficiently impregnable (cf. EN 350-2 and NF B 50 105-3). 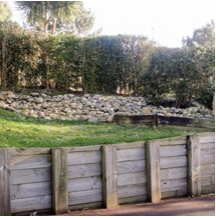 water retention, a majority of exterior joinery applications, outdoor play areas, green area developments, agricultural buildings, decking and duckboards, safety barriers and logs placed horizontally, are assigned to this use class. This includes all wood-rotting fungi and wood-destroying insects including termites. The attack the entire wood volume, as it gets wet. In these uses, certain species stripped of sapwood do not require treatment (except for protection against termites). This is the case, for example, with the duramen, or “heartwood”, of oak, chestnut, pine, larch, Douglas fir and other species of tropical origin. When treatment is required, it is only applied to species that are sufficiently impregnable (cf. EN 350-2 and NF B 50 105-3).